Hunspach is south of Wissembourg in the Bas-Rhin department of the Alsace region, within the boundaries of the Natural Regional Park of North Vosges. It will come as no surprise when you visit to learn that the village is officially classified as one of the 'most beautiful villages of France' since it is a gorgeous little village both very typical of those in the region...and at the same time completely unique. The centre of Hunspach has lots of very similar looking ancient colombage (half-timbered) houses, all painted white and it is this continuity of appearance that makes the village a bit special: many similar Alsace towns and villages have their houses painted in a profusion of pastel colours, which is also very picturesque but gives a very different look to the villages as a whole. 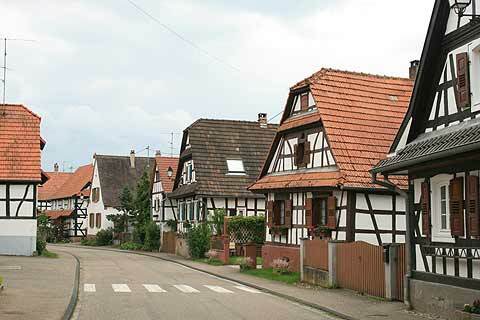 The houses in Hunspach are of course very old, but are so well maintained that you could almost think yourself in a new upmarket housing development. We do wonder what the original owners of the houses would think if they could see the village 'beautified' as it is today?! You will notice that a good number of the houses have glass in the windows which looks rounded. This is a crafty trick to allow the residents to look out of the windows while stopping people on the outside from seeing in! 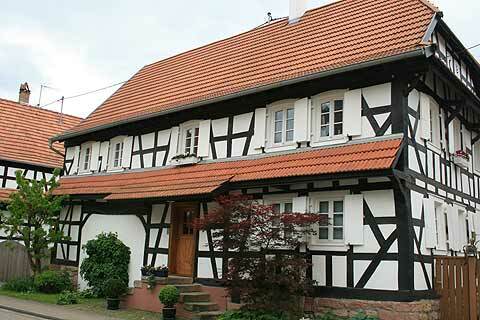 The village also appears to be full of keen gardeners as each house has a tiny garden crammed with plants. In season there are a profusion of flowers hanging from virtually all the windows in the town providing a very pretty contrast to the white houses: these flowers are mostly the 'trademark' geraniums that you will quickly come to associate with the villages of Alsace. There is a tea shop in Hunspach making this a pleasant place to stop for a break. Otherwise there are a couple of small shops and restaurants but facilities are generally quite limited. There is also a small church in the village, most notable for its red stone clocktower. In stark contrast to the perfect village of Hunspach you can also visit the nearby Fort de Schoenenbourg. This is a substantial concrete fortification that was part of the Maginot Line, created as part of the defences to prevent the invasion of France during the Second World War. This is the largest fort of its type in Alsace and a visit includes a tour of the extensive underground rooms and tunnels. 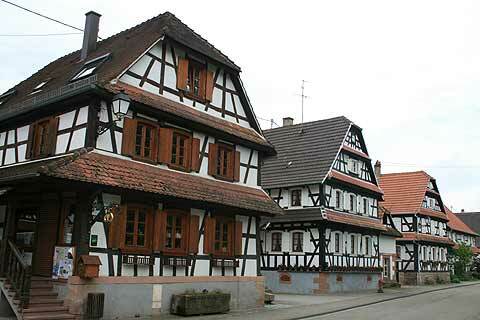 Back to visiting Alsace villages, you will find lots of interest in the region around Hunspach such as Seebach and Wissembourg, Cleebourg and Hoffen among many others - you will discover your own favourites when you visit.